Tonight is the opening night of the Maryland Film Festival–a personal highlight of the year for me. It is especially sweet this year as I now live and work in Baltimore! Strangely enough, it seems that I had more time to blog about Maryland moving images when I lived in California. Now that the overlap between work and hobby is even more closely intertwined I find myself really slacking on MarMIA. A recent blog post that I wrote for work got me curious about previous Baltimore-area film festivals and figured it would be a great topic to FINALLY write about here. Baltimore is obsessed with movies–the intense support, demographically dispersed audience, and high attendance of the Maryland Film Festival (MFF) further proves this. On their website MFF quotes David Simon describing the festival to be “an essential stop in the festival circuit”, and perhaps I am biased, but I think it has put Baltimore on the independent cinema map with growing real estate every year. Why is this small American port city so in love with watching and making moving images, both blockbusters and non-commercial indies? There are probably many layers of answers to that question, but one avenue I want to focus on is who and what helped us get here. Moving images really blew up in the late 1890s, so they are a young medium. The rise of film studies as an area of academic higher learning started to gain traction in the 1960s, and then with the introduction of Super 8mm film and the Portapak video system, filmmaking began to be even more accessible to individuals–it was cheaper, easier to haul equipment around, and less technically challenging (NB I use the term “filmmaking” here to refer to shooting on videotape as well as film). With this context, it make sense that the first “Maryland Film Festival” occurred in February and March of 1967. It was put on by MICA and WBAL-TV and held in the Mount Royal Station Building. It was initially started by MICA students and professors, and one person in particular, Jerry (Jaromir) Stephany, a still and motion picture photography professor. Paul Sharits was also a teacher at MICA at this time, and The Baltimore Sun wrote the following approximate quote of Mr. Sharits: “He said that Baltimore ‘had great possibilities’ as a center for filmmaking”. In 1968 and 1969, the festival became a joint effort between MICA, JHU and Goucher, with such notables as Jonas Mekas and Stan Vanderbeek signing up as judges. It seems like things were going really well, but for some reason 1969 was the last year of the Maryland Film Festival (until the name was unearthed 30 years later). I can’t seem to find out why, but it was replaced by “The Baltimore Film Festival” which was run by an English professor at the University of Baltimore named Harvey Alexander, with the films screening in the Langsdale Library Auditorium. Full disclosure: I work for Langsdale Library! This is where I initially came into the story while looking for the history of our auditorium. And like many things in life, it is all coming full circle as the Langsdale Auditorium is one of the major venues for the MFF this year. From 1970 through 1972, the Baltimore Film Festival was put on by the University of Baltimore and the American Film Institute (AFI). Then in 1973 it started to be held at Towson State College (now Towson University), still under the direction of Harvey Alexander. 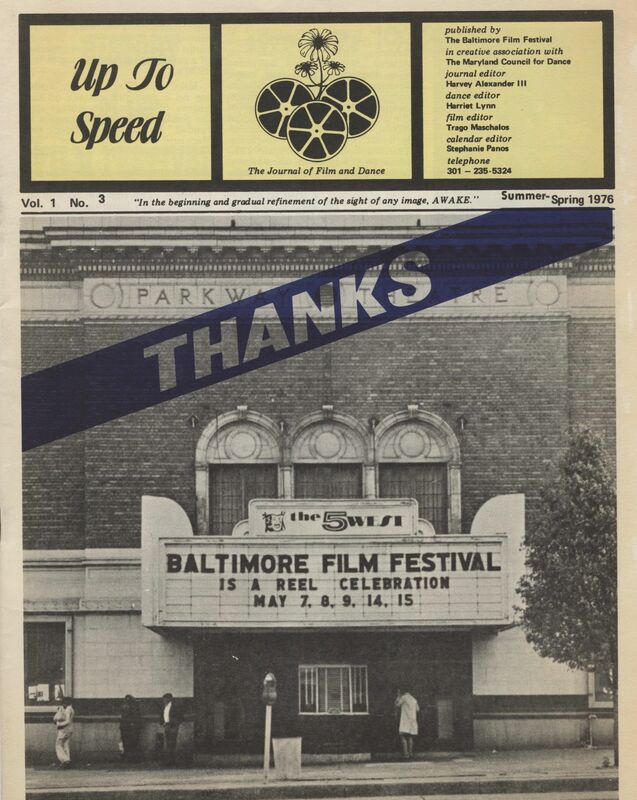 Starting in 1973, the Baltimore Film Festival worked on bringing underground motion pictures to Baltimore year-round, not just for a few days in the spring. “The Baltimore Film Forum” phrase started popping up in newspapers in November of 1976 as the organizational arm of the festival, and by 1977 Harvey Alexander stepped down and/or was ousted as the director of the festival. Mr. Alexander was not happy about this turn of events and apparently even took the Baltimore Film Forum to court–however he did not win that battle. Starting in 1978, “The Baltimore International Film Festival” was held in the spring by the Baltimore Film Forum. This was the status quo and main film festival in Baltimore until 1994; that April is the last mention of the Baltimore International Film Festival that I could find in local newspapers. Then the Baltimore Film Forum ceased operations in January of 1996. The current successful iteration of the Maryland Film Festival was founded by Jed Dietz in 1999, and the rest, as they say, is history. Please let me know if I have written anything in error as my research was relatively limited as everyone is getting ready to put this year’s festival on. I conducted most of my research from historical newspaper databases and from two scrapbooks lent to me by former member of the Baltimore Film Forum, Marc Sober. These scrapbooks were created and originally owned by Helen Cyr, the chief of the Audio-Visual Department of the Enoch Pratt Free Library from 1972 until 1988, a founding member of the Baltimore Film Forum and the president of the Forum from 1983 through 1988 and then again from 1991 until her death in 1993. “Maryland Film Show Scheduled”, The Sun (1837-1988) [Baltimore, Md] 26 Feb 1967: FE6. “March Film Festival”, The Sun (1837-1988) [Baltimore, Md] 04 Feb 1968: D10. “Maryland Film Festival Another Art Form”, Arnett, Earl. The Sun (1837-1988) [Baltimore, Md] 23 Feb 1968: B3. 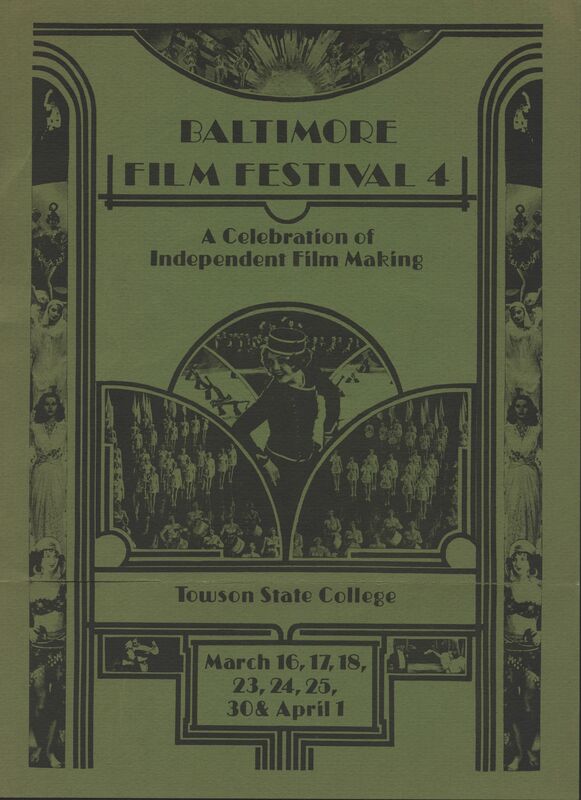 “Maryland Film Festival”, Gardner, R H. The Sun (1837-1988) [Baltimore, Md] 02 Mar 1969: D9. “Theater Notes Film Festival To Include Two Shows”, The Sun (1837-1988) [Baltimore, Md]; Apr 1, 1970: B4. “Film festival: night of the long knife?” Banisky, Sandy. The Sun (1837-1988) [Baltimore, Md] 07 Mar 1977: B1. “Helen Cyr, Film Forum president and cultural force in Baltimore”, Bliss, DeWitt. The Sun [Baltimore, Md] 20 July 1993: 5B.